1. To reconstruct the history of life on earth. 2. To examine the role of the fossil record in determining evolutionary history. 3. To become familiar with anatomical similarities between various groups of organisms. 4. To examine the importance of the molecular data supporting the theory of evolution. 1. Evolutionary biologists assemble clues from fossils as well as from structures and informational molecules in modern species to paint portraits of past life. Cladograms are diagrams that group species based on specialized characteristics that only they have inherited from a recent common ancestor. 2. Fossils can reveal the immediate environment of an ancient organism, clues to a scene, or even global change. Fossils form in a variety of ways. The time that a fossilized organism lived can be estimated relatively from its position in rock strata, or more definitively by following the extent of breakdown of one radioactive isotope into another, which reflects passage of time. 3. Comparing bones in various dinosaurs and birds vividly illustrates evolutionary change. Homologous structures are retained from a shared ancestor, whereas analogous structures reflect adaptation to a similar environment. Vestigial organs and similarities among embryos are also evidence of evolution. 4. Molecular evidence for evolution includes similarities at the gene, protein, chromosomal, and genome levels. Gene sequence differences among species can be placed in a time frame derived from mutation rates. Evolutionary biologists assemble clues from fossils as well as from structures and informational molecules in modern species to paint portraits of past life. Cladograms are diagrams that group species based on specialized characteristics that only they have inherited from a recent common ancestor. We are going to skip most of this section. Don’t worry about systematics, cladograms, clades, or derived characters. What you should focus on from this section is the fact that the field of paleontology, the study of fossil remains or other clues to past life, allows biologists to elucidate evolutionary relationships among various groups of species. Using the fossil record, biologists have been able to view what types of organisms have lived on earth in the past and how those organisms have changed over time. Chapter Concept 17.2: What Can Fossils Reveal? Fossils can reveal the immediate environment of an ancient organism, clues to a scene, or even global change. Fossils form in a variety of ways. The time that a fossilized organism lived can be estimated relatively from its position in rock strata, or more definitively by following the extent of breakdown of one radioactive isotope into another, which reflects passage of time. As demonstrated in Chapter 14, Charles Darwin presented convincing evidence for evolutionary change from various scientific fields including the fossil record, the distribution of plants and animals, comparative anatomy and from comparative embryology. Since Darwin’s time, biologists have presented evidence for evolutionary change from the fields of comparative molecular biology, genetics, population ecology, developmental biology, and animal behavior. In fact, many biologists argue that evolution is the single unifying theme of biology. One of the most convincing lines of evidence for evolutionary change comes from the fossil record. Fossils are the remains or imprints of past life. They include bones, teeth, imprints, etc. 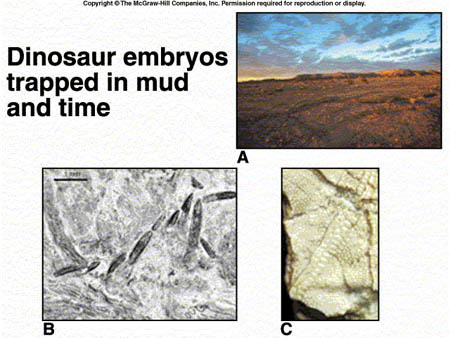 Fossils form only if the body or imprint of the organism is rapidly buried in a bog or at the bottom of a sea or lake. Over time they become buried by successive layers of mud and sand. Pressure from these layers create sedimentary rock where the fossils are found. Unfortunately, the chances of such a scenario actually occurring are relatively rare. In fact, most plants and animals perish and leave no trace of their existence and, those that do, are rarely found by scientists. The net result is in an incomplete fossil record over time. As discussed in the text (unfortunately not very well), sediment is deposited in layers. The fossils in the top layers are the most recent and those in the deepest layers are the oldest. The order in which fossils are deposited in sedimentary layers suggests the sequence of evolutionary changes over time. As one moves from old to new layers, the fossils become more complex and begin to resemble forms in existence today. By studying the fossil record, one can see a theoretical story of evolutionary change over time. Not only does this record demonstrate the kinds of organisms that have inhabited this earth over time, it demonstrates how they have evolved. As one studies subsequent changes in the types of fossils found within strata, one is able to deduce possible evolutionary changes. Particularly interesting are fossils that serve as transitional links such as Archaeopteryx (Figure 17.3) which serves as an intermediate link between birds and reptiles. Other transitional forms such as Eustheopteron,Seymouria, and therapsids have allowed biologists to deduce that fishes preceded reptiles, which preceded both birds and mammals in the history of life on earth. The fossil record suggests that life first appeared in the Precambrian Era. Interestingly enough, the first photosynthetic prokaryotic fossils appear in the fossil record as early as 3.5 billion years ago. The first eukaryotic fossils appear about 2 billion years ago and multicellular organisms appear about 700 million years ago. All major groups of animals appeared during the Cambrian Period by the end of the Paleozoic Era (545-245 million years ago). Explosive diversification began at the beginning of the Cambrian Period, which marked the appearance of all modern animal phyla with fossilizable skeletons. During this period arthropods (insects, spiders, crustaceans and barnacles), brachiopods, mollusks (snails, clams and squid), sponges, echinoderms (starfish and sea urchins), cnidarians (jellyfish and corals), and the first chordates (today including amphibians and mammals) first appeared in the fossil record. Biologists refer to this as the Cambrian explosion and very few body plans have evolved since this time, suggesting that it may have been a one-time phenomenon. Land plants and animals diversified during the Mesozoic Era (248-65 million years ago). During this era reptiles, birds, turtles, mammals and ammonites (marine invertebrates) first appear in the fossil record. During the Cenozoic Era (65 million years ago to present) mammals, birds, insects and plants diversified. It has been estimated that 99% of all species that have ever inhabited this earth are now extinct and have been so for millions of years. The absolute cause of extinction is still somewhat of a mystery. Species may go extinct due to environmental change, competition or predation. Some species survive such changes while others do not. The rate of extinction has been relatively constant since the Cambrian Period with the exception of 5 mass extinction events. After each extinction event, diversity increased dramatically. The most controversial extinction event occurred 65 million years ago at the end of the Cretaceous. This resulted in the extinction of the dinosaurs and half of all plant and animal species. The Cretaceous extinction has been classified as “controversial” due to the fact that scientists are somewhat divided as to its cause. One of the most popular explanations for this extinction event involves the collision between the earth and an asteroid. The sediment released into the atmosphere by such a collision may have been large enough to block out solar radiation and hinder the photosynthetic abillity of autotrophic organisms. In addition to the fossil record, evidence for evolution is provided by biogeography as well. Darwin was keenly interested in biogeography—the study of the past and present distributions of plant and animal species. As evidence for his theory of evolution, Darwin noticed that species all over the world are most closely related to species that live nearby; indicating descent with modification from a common ancestor. The process of continental drift explains the unique distribution of several fossil types throughout the world. For example, fossils of the same species of seed fern have been found in all of the southern continents. Such a scenario suggests that this species evolved before the separation of Pangaea. 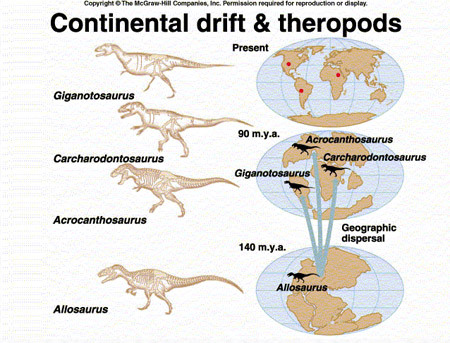 As indicated in the figure on the right, continental drift explains the geographical distribution of fossils of certain theropods. As the continents drifted, populations of Allosaurus were separated from one another, eventually evolving into different species. Anatomical similarities among these three species can be seen today in fossil evidence. According to the theory of continental drift, the mammalian fossils of Australia, South America and Africa should all be similar. However, the mammalian fossils associated with these locales are quite distinct from one another. Why do you think this might be the case? 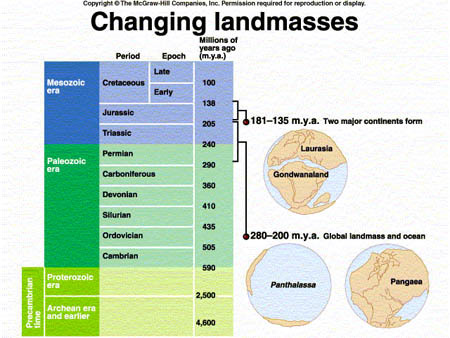 Skip pages 323 – 324 (formation of fossils) and pages 324 – 326 (estimating age of fossil). Comparing bones in various dinosaurs and birds vividly illustrates evolutionary change. Homologous structures are retained from a shared ancestor, whereas analogous structures reflect adaptation to a similar environment. 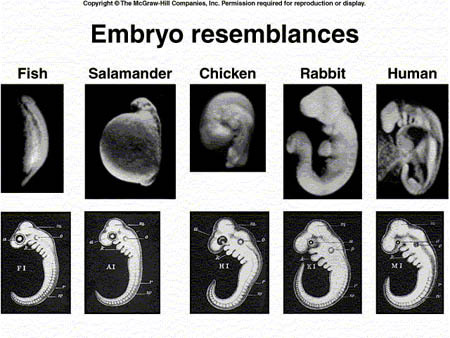 Vestigial organs and similarities among embryos are also evidence of evolution. When studying anatomical structures of various organisms it is clear that varied organisms share a common body plan (refer to figure at right). Homologous structures are defined as structures in different organisms that have a similar function and the same origin. 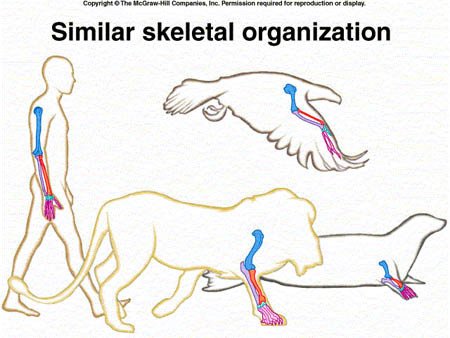 For example, the figure on the right demonstrates that the forelimb of a lion, bird, seal and human all contain the same bones. Biologists argue that such homology suggests descent with modification from a common ancestor. In other words, the reason behind the fact that the forelimbs of these organisms contain the same bones lies in the fact that they all evolved from a common ancestor that had these bones. Scientists can follow changes in homologous structures through time utilizing the fossil record. Such a scenario allows biologists to “visualize” evolutionary changes over time. 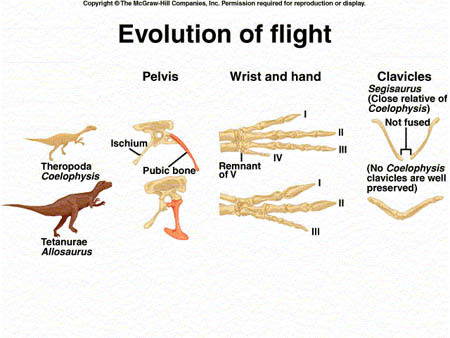 For example, a comparison of homologous bones allows scientists to assess the possible evolution of flight (refer to figures at right). 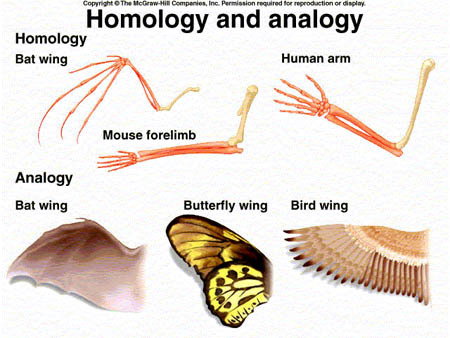 In contrast, the wing of a bird and the wing of a bat are classified as being analogous structures since their structures are unrelated. One of the strongest pieces of evidence for evolutionary change provided by the fossil record are vestigial structures—structures found in an organism with little or no known function. Such structures are thought to be remnants of a structure that at one time had a function in an ancestral species. 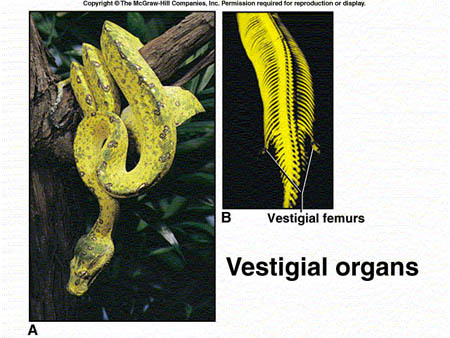 For example, both whales and snakes have vestigial pelvic and leg bones, left over from ancestral species that walked. Can you think of a vestigial structure in humans? The field of comparative embryology also serves to provide evidence for evolutionary change over time. Although it is often easy to distinguish between adults of different species, it is often difficult to distinguish embryos from one another (Figure17.13). Developing organisms look very similar to one another and often pass through developmental stages that resemble the organisms from which they evolved. Chapter Concept 17.4: What Can Molecular Evidence Reveal? Molecular evidence for evolution includes similarities at the gene, protein, chromosomal, and genome levels. Gene sequence differences among species can be placed in a time frame derived from mutation rates. Karyotypes can provides clues to evolutionary histories between various groups of organisms. Chromosomes vary in size and banding pattern. Similarities in both size and banding pattern in the chromosomes between two species indicates that the two species shared a very recent common ancestor and are closely related. For example, Table 17.1 on page 330 uses chromosomal similarity to elucidate relatedness between humans and other species. As you can see, the chromosomes of humans, chimps, gorillas and organgutans are extremely similar, inidicating that all four species shared a very recent common ancestor and are closely related to one another. As indicated in Chapter 13, all cells rely on DNA to make protein, suggesting that this has been passed down from an ancient common ancestor. Using new technologies, biologists are able to determine the amino acid sequences in proteins to determine evolutionary relationships among various species of organisms. Biologists have found that the more closely related two species are, the greater the similarity in amino acid sequences of their proteins. Such comparisons allow scientists to deduce evolutionary relationships between various organisms. Since DNA molecules are highly conserved and passed from one generation to the next, base sequence pattern should indicate evolutionary relationships. Via the process of DNA hybridization, scientists can accurately determine the degree of relatedness between various groups of species. Matches in base sequence between species indicate a high degree of relatedness. 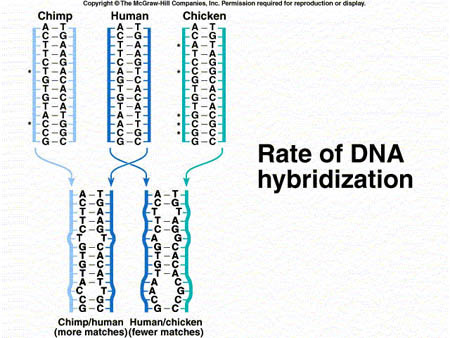 For example, in the figure on the right you can see that more matches are made between a human and a chimp than between a human and a chicken. This indicates that the human and the chimp shared a more recent common ancestor than the human and the chicken and are closely related. In any two species, the number of molecular differences in a common molecule is proportional to the time since divergence of the two species. This concept is termed the molecular clock and it allows scientists to determine the amount of time that has elapsed since the two species diverged from one another. According to this concept, the greater the number of differences, the greater the amount of time since divergence of the two species. According to the concept of the molecular clock, which of the following are most closely related? Species A differs from species B by 5 amino acids in a shared protein. Species B differs from species C by 10 amino acids in the same protein. 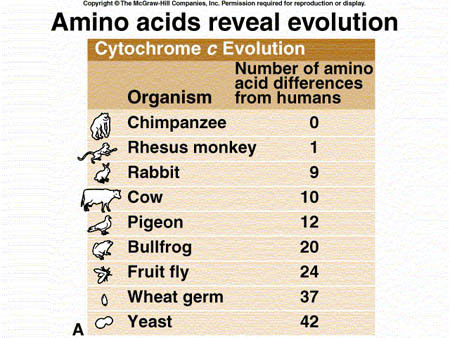 Species A differs from species C by 14 amino acids in the same protein. 1. Photosynthesis is thought to have evolved by _________ billion years ago. 2. Transitional evolutionary forms, such as Archaeopteryx, are rare in the fossil record. Why do you think this is the case? a. Because few transitional forms have existed on earth. b. Because the fossil record is incomplete and does not portray all evolutionary transitions. c. Because intermediate forms are incapable of become preserved. d. Because scientists have lost them in museums. 3. Which of the following provide evidence of evolutionary change over time? a. the degree of relatedness between various groups of species. b. the amount of DNA within a fossil. 5. The fossil record demonstrates that the oldest fossils are in the _________ sedimentary layers. 6. ____________ structures have a similar function and the same origin. 7. __________ structures are found in an organism, but serve no known function. 8. The ________________ utilizes changes in amino acid sequences to help scientists determine the divergence time between two species. 9. The study of the distribution of plants and animals is termed _____________. 10. Most of the current body forms originated during the ____________ Period. 1. Australia, South America, and Africa all have their own distinctive mammals because mammals evolved after the separation of the continents. 2. The appendix is a vestigial structure in humans. 3. Species A and B are the most closely related. Species A and C are the most distantly related. Önceki Yazı Evrimin Bilimsel Dayanağı Yok mudur?